Cerebral infarction. 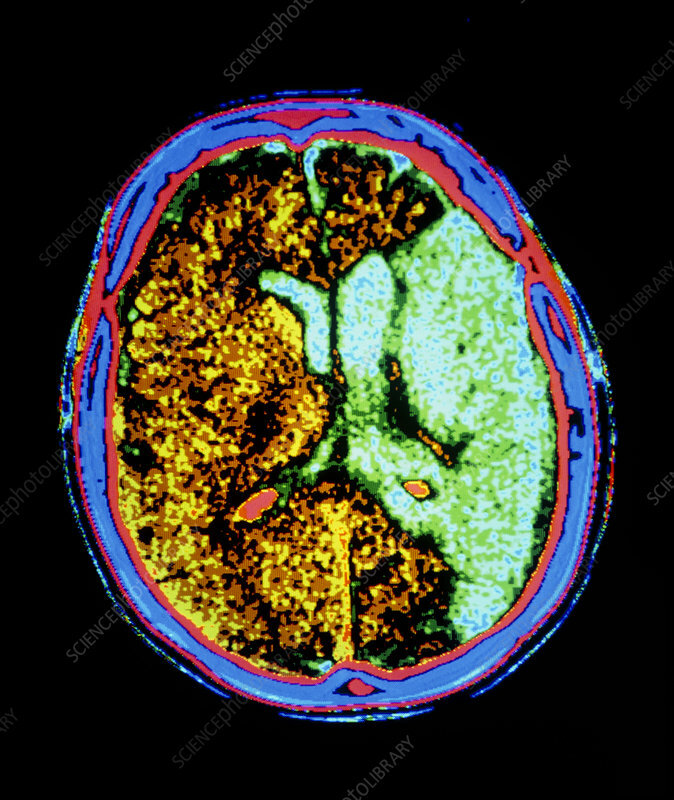 False-colour computed tomography (CT) scan of the brain, showing a cerebral infarction. The infarct (area of dead tissue) appears as the blue cerebral region at right. Normal brain tissue is brown. Cerebral infarction is caused by an obstruction in a cerebral artery with resulting interruption in the blood supply. Artery blockage may be due to thrombosis (blood clot) or embolism (a fragment or air bubble in the blood). The infarction may also be due to haemorrhage from a weakened arterial wall. The affected area is starved of oxygen with consequent tissue death. The result is a nervous disturbance called a stroke or cerebrovascular accident (CVA).